Normally when I flip through a cookbook the title is what grabs my attention, but not this time. I love Gooseberry Patch cookbooks because the recipes are submitted by people like you and me and a lot of the time they have stories that go along with them. This story caught my attention. What a wonderful memory! Food is often attached to memories and there’s nothing better than having a recipe or food trigger a memory of a lost loved one. 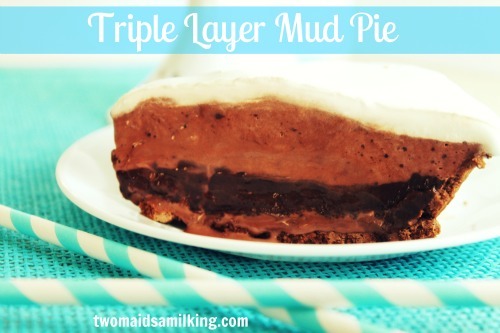 This pie is totally for the chocolate lover at heart! I even went one step further and substituted chocolate milk for the milk! I mean if you are going to go this far you might as well go all the way! Chocolate milk has the same nutrition as white milk, including bone-building calcium and protein. Oh and did you know? Halloween is coming up and Chocolate milk is the Official Drink of Halloween, nutrition in disguise! Whether you drink a glass, pour it on your cereal for a treat or enjoy it in this pie, be sure to grab some chocolate milk the next time you are at the grocery store. Oh and no chocolate milk doesn’t come from chocolate cows! 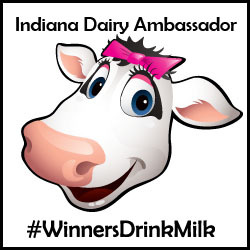 Indiana Dairy asked that I blog a recipe using chocolate milk. The opinions expressed are all mine.